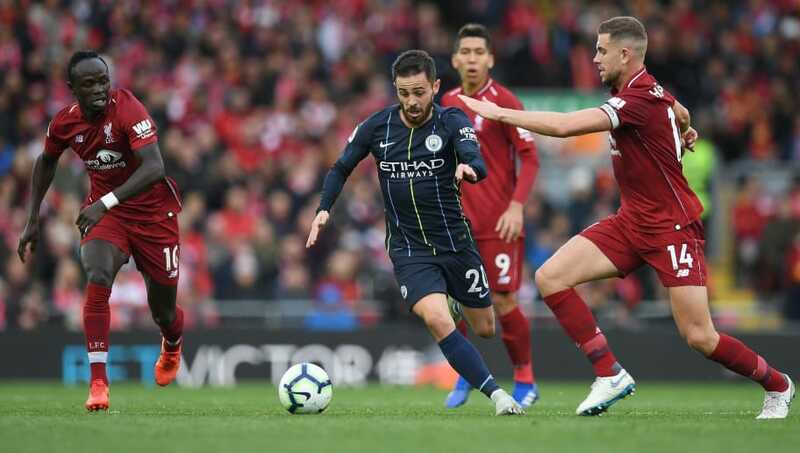 Manhester City welcome Liverpool to the Etihad Stadium on Thursday night for a mouth-watering Premier League clash to kick off 2019. Liverpool have opened up a seven-point gap over the Citizens to ramp up the pressure on Pep Guardiola's men, who will be desperate to claim all three points after recently slipping up against Crystal Palace and Leicester, handing Jurgen Klopp's men the advantage in the title race. The Reds have been in scintillating form of late, winning their last eight games in all competitions, scoring 23 goals in the process. Victory on Thursday would put ​Liverpool in pole position to claim their first top-flight division title in 29 years. Guardiola has been handed a massive boost with the news that ​Fernandinho will be fit enough to start on Thursday night after escaping injury following a shocking challenge from Saints' midfielder Pierre-Emile Hojbjerg. However, the Spanish tactician will be sweating over the fitness of star man ​Kevin De Bruyne who is a doubt with a muscular problem. With left-back Benjamin Mendy still out injured and Fabian Delph suspended, Oleksandr Zinchenko is expected to remain in defence, despite gifting ​Southampton a goal on Sunday. More good news for the Citizens is that ​David Silva made his return on the weekend and came through unscathed, meaning he is expected to line-up alongside Fernandinho in midfield. The Reds have a number of injuries to cope with as defenders as Joe Gomez and Joel Matip will both be unavailable for the trip to Manchester due to injury. Dominic Solanke is a doubt with a muscular issue whilst ​Alex Oxlade-Chamberlain is still a long-term absentee, although the Englishman is expected to return to full-training next month. Good news for Klopp comes by the way of ​James Milner returning to training on Tuesday after missing Liverpool's last four fixtures with a hamstring injury. However, he is unlikely to be thrown back into the starting XI for a game of this magnitude after being out for a number of weeks, so a place on the bench is more probable come Thursday night. Man City​ ​Ederson; Walker, Stones, Laporte, Zinchenko; Silva, Fernandinho, Silva; Sane, Aguero, Sterling. ​Liverpool ​Alisson; Alexander-Arnold, Lovren, Van Dijk, Robertson; Fabinho, Wijnaldum, Henderson; Salah, Mane, Firmino. The two clubs have a ​vast history of playing one another, dating back to 1896. 211 games have been played out since, with Liverpool having much the better record over their Manchester counterparts - the Reds have won almost half, 104 victories to be exact, whilst losing out on 54 occasions. In recent times, there have been some memorable games including Liverpool's 4-3 win in the Premier League last season, as well as their meeting in the 2018 Champions League quarter-final that saw Klopp's men progress. Earlier this season the two sides played out a tight affair that ended 0-0 after Riyad Mahrez missed a late penalty for ​Man City. Guardiola's men have been unusually inconsistent in recent weeks, surprisingly losing two successive Premier League games against ​Crystal Palace and ​Leicester - allowing Liverpool to open-up a seven-point gap at the top of the table. However, City returned to winning ways on Sunday as they were victorious against a resurgent Southampton side under Ralph Hasenhüttl, running out 3-1 winners with the returning David Silva on the scoresheet. Liverpool looked unstoppable in December - eight games, eight wins - and Klopp has got his side playing some scintillating stuff. ​Mohamed Salah, ​Roberto Firmino and ​Sadio Mane have all been in flying form, the three all managing to get on the scoresheet against ​Arsenal last Saturday. Perhaps more impressive is the Reds' defence, which looks impenetrable. Klopp's side have conceded just eight league goals this campaign - after conceding 38 last season - the Reds now have a solid foundation to mount a serious challenge for their first ever Premier League title. When the pair met back in October, the last result that was expected was a 0-0 draw. Guardiola's men set up more defensively than they have done on previous trips to Anfield and both sides looked quite happy to settle for a point. A lot has happened since that meeting, with City slipping to third in the Premier League table, meaning they must claim all three points against the table-toppers - which could play into Liverpool's hands. Klopp's men can play on the counter with the devastating pace of Salah and Mane, however City are heading into the fixture off the back of an impressive 3-1 victory on Sunday and will need to go up another gear on Thursday night to put themselves right back in the title race.